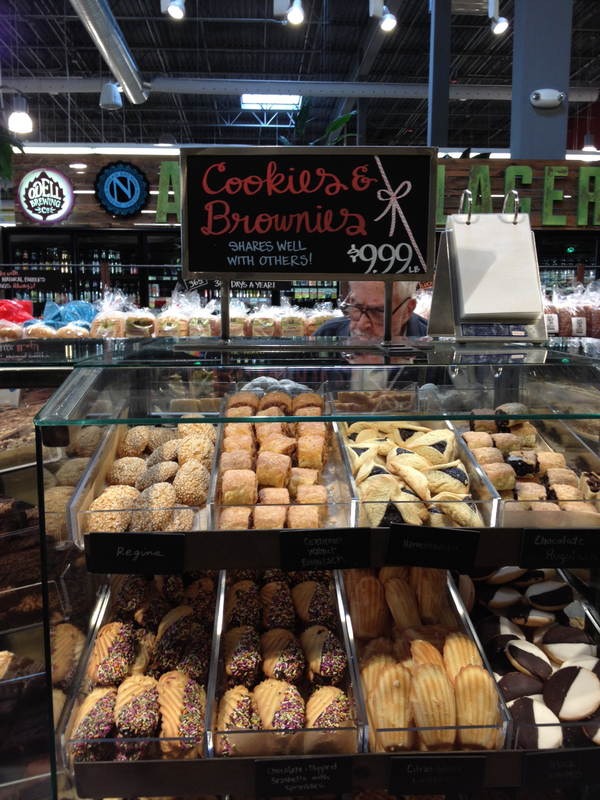 Whole Foods Cookies and Brownies by the pound! Look what I found at Whole Foods! These are not your average cookies. There are Madeleines, all kinds of bars, amaretti, shortbreads, brownies, gluten free cookies, and more. If you are watching your calories…walk by quickly, and avert your gaze! Posted in baking, Cookies, sweet makers and tagged dessert, food, whole foods. Bookmark the permalink. have always wondered why Whole Foods didn’t have a better bakery. Looks like they’ve been working on that! The big question is: What did you buy? I bought Madelienes, which were a little dry, but that’s because they weren’t fresh from the oven. The Amaretti cookies were great, and the biscotti were small and perfect with coffee. Wow, I salivated looking at all those delicious goodies! Now I want to make a trip to whole foods very soon! Thanks so much for these dandy candy reminders! They had wonderful large frosted sugar cookies at Xmas that looked like snowman, stockings, gingerbreadme, etc.. do they have any frosted ones like those for Valentines ?